Guest Post by travel addict and regular contributor, Shell R. Interested in guest blogging? Let us know. Salt Lake City for a week? Oh, the options are endless, really. Here are a few the things to do in Salt Lake City, at least for those who need a drink. There is a rumor going around that you can’t drink alcohol in Salt Lake or that you need to buy into a “club” to drink alcohol. Not anymore. The law changed just a few years ago bringing an end to the need of having to pay a fee to be a “member” of a private club. We did find the bars might offer you some nuts or if it was a restaurant you had to order “something” to be served an alcoholic beverage, which was more than annoying. 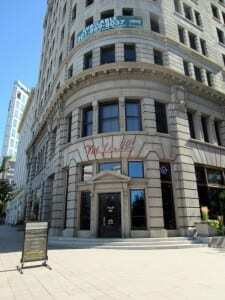 There are several great hotels in Salt Lake City. I like to use TripAdvisor.com to help narrow down the choices. (I seem to find TripAdvisor’s reviews more accurate and less advertorial.) Remember, you MUST take online ratings with a grain of salt so don’t base everything off of their reviews. Look for themes in what people are saying, don’t just focus on the high’s and low’s of the reviews. One thing to note about the Grand America Hotel, I read several online reviews from people complaining about being charged $10 for the pool. This fee is only for the inside heated pool connected with the spa. The outside pool is free and it was nice. For breakfast is a must! 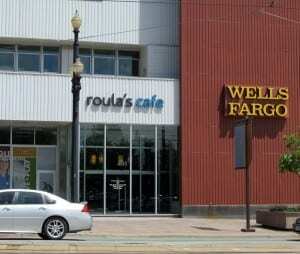 Roula’s is one block north of the Grand America Hotel on the Grand America side of the street. Nectarios, Roula’s son, was very friendly and made us feel right at home each day we went in. I definitely recommend this place. Make sure to try The Classic, hash browns, two eggs, one meat, side of toast $5.59. For lunch, we had some excellent burgers. While shopping downtown we stopped in for a couple of beers at the Beerhive Pub on Main Street. There is an ice section built into the bar to put your drink on to keep it cool. I wish every bar had this… This place was great and the beer selection was impressive. 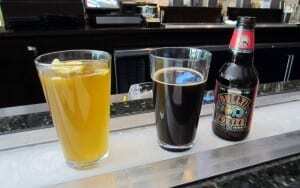 They have over 200 delicious beers from around the world. We also visited Poplar Street Pub where not only did we have a good beer but we got a ton of information on the drinking laws and how they have changed in Salt Lake City from the bartender. She was awesome! This place was like your everyday neighborhood fun bar. One night we walked to meet some friends at Maxwell’s. During the day we shared some pizza here but at night they move the tables and it turns into a dance club. It was a lot of fun, oh and the pizza is great too. Don’t miss the $2 Tuesdays spaghetti, meatballs, and wine starting at 7pm. We stopped at the Desert Edge Brewery for a sampling of the different beers they make. This brewery is located 5 minutes from downtown in historic Trolley Square. This is outside shopping with some unusual stores mixed with the normal mall stores which was cool. This brewery has been around since 1972 when it used to be called The Pub. They had a very tasty variety of beers but they weren’t on tap at any of the bars around the hotel which was a bummer. For more outdoor shopping be sure and visit the Gateway Mall downtown. The UTA train stops here and they have a wide variety of little shops and eateries which are excellent. 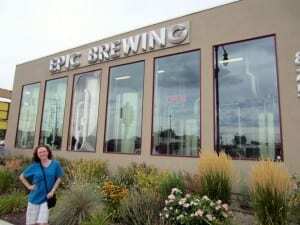 During the week we met some friends for a tour at Epic Brewery. This brewery is tiny so the tour was short but very informative. They do everything from brewing the beer to the bottling on a tiny bottle machine. We wanted to stay for a sampling but they required you to buy food first. We had just eaten and the sandwiches they had available were a bit pricy. They had a little store there whe re you could buy bottles so we decided to have our own sampling back at the hotel. TIP: If you buy six bottles you get a discount. One of our friends only bought five and they didn’t tell him about the discount. Annoying. 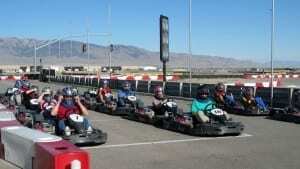 If you’re a car fan you need to check out Miller Motorsports Park. There is a museum inside that provides a 45-minute tour of the collector cars they have. I’m not a huge fan of cars so this wasn’t nearly as cool for me as it would be for someone more into it. I was there for the rides. Yes, rides! We went with a big group so the lines were a little long for us to get through but I doubt that’s always the case. They recommended people wear long pants and long sleeved shirts, which we did; it was toooo hot. Don’t do it. I would have been just fine in shorts and a t-shirt for everything we did. As for rides, go-karts were so fun, a must to check out. The raptor ride takes you (with a driver) in a slow moving truck over steep, man made hills. You can ride in a fast race car with a driver but take a hat/sunscreen in case you have to wait in line; you will be waiting outside in the sun. I typically like zip lines but theirs regulated your speed coming down. Frankly, it was more fun when they pulled you up to the top before the drop. While shopping one day we decided to take the train up to the University of Utah. You do have to pay to ride the train up that way but it was under $5 each. We walked up to the gate of the closed stadium and we asked a nice custodian if we could come in and check out the stadium. To our surprise she said YES and offered to give us a private tour. She said she has given several tours like this when people walk up . She took us to top and it was great, especially so my boyfriend could see where the college football games are held that he watches on TV. 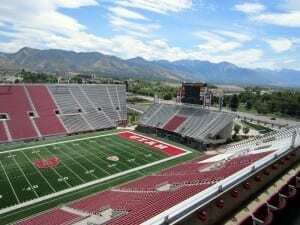 The stadium looked cool, even though it was empty, with the mountains in the background. We walked to the other side and we could see all of downtown, which was beautiful. 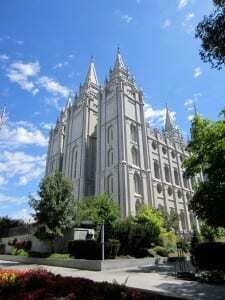 Have you been to Salt Lake City? What are your must do’s (and must not do)? Please share your tips on things to do in Salt Lake City in the comments. This is a city that I’m really intrigued by! Maybe on our next US trip we’ll get there!